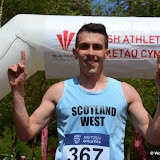 The popular tourist destination of Betws-y-Coed in North Wales was turned into a mini Yorkshire county for the 18th British Inter Counties Fell Championships, with the White Rose flags and running vests everywhere in the Gwydyr Forest trails venue. 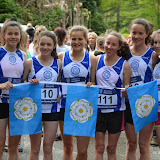 Yorkshire once again dominated the team awards running away with four team gold and two team silver medals and is still the only county to support these championships every year with a full contingency of athletes. Read the full report and results. 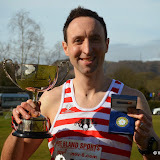 Three times British, twice English, 11 times 3 Peaks Cyclo Cross & World Sky Running Champion Rob Jebb presented the trophies, medals & prizes at the 38th championships which were incorporated within the FRA English Flower Scar event with separate races for both men & women run over 9k/470m. 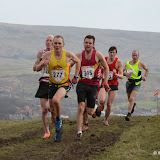 34 year old Ben Mounsey of Calder Valley Fell Runners retained the individual title in a brillant race from Tom and Mark Addison with with only 28 seconds separating all three medallists at the finish. 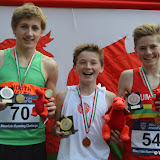 Tom now has two silver medals having collect his other in 2013 behind champion Rob Jebb. 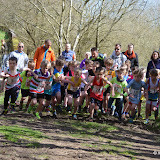 Ben led his beloved club Calder Valley Fell Runners to the team gold just like last year with back up from Gavin Mulholland in fourth and Karl Gray in sixth, this is the third time these athletes have counted. Club stalwarts Gavin and Karl have been the Golden lads in all of the clubs five team wins, 2009, 2010, 2011, 2014 and 2015. 'I'm absolutely delighted about winning again and to be honest I'm not really sure it's sunk in yet. 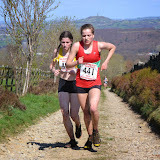 I'd looked at the names of the past winners and noticed only two people previously had managed to defend the title - Bob Whitfield of Kendal AC in 1985, 1986 & 1987 and Ian Holmes of Bingley in 2000 & 2001 and 2005 & 2006. So when I returned the trophy I knew I'd need a top result if I was to take it home again. 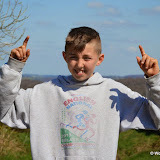 In terms of the race I really felt confident and I was looking forward to having a real crack at the top lads and believed I had a chance of winning - I'm in top form, it's a local race, I'd reccied it and I knew the route suited me. As the race progressed it soon became clear that trying to hang onto the coat tails of Simon Bailey was too tough a task, so I switched my aim of first, to a top five finish and winning the Yorkshire Championship. As I watched Simon, Rob Hope and Rhys FR slowly pull away I tagged onto the back of Tom Addison in fifth knowing that if I could stay with him to the top of the main climb I could pass him on the descent. By the turn we had opened a decent gap over Rob Jebb in seventh, so that gave me loads of confidence. On the descent I got my breath back and attacked on the steepest section, I could hear Tom behind me on the final climb, but I knew so long as I got to the top of the final descent first I wouldn't be beaten for fifth. 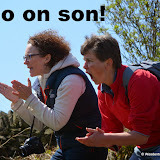 I really enjoyed that last mile downhill knowing I'd won the Yorkshire title for the second time in a row. 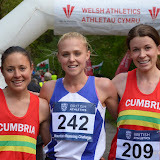 Plus what made this one even sweeter than the last was the fact I'd managed to win the trophy in a highly competitive English Champs race, I've finished fifth in a English champs race twice before, but I think this was a stronger field. The icing on the cake was of course CVFR winning the team for the fifth time in the last seven years and the third time me and my best bum chums Gav and Karl have been the winning team together. Happy days.' Said Ben a very proud Yorkshireman. 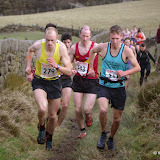 The MU23 title and Alistair Brownlee trophy was won by Tom Saville of Dark Peak Fell Runners with 2012 champion Joe Crossfield in second and Henry Jepson in third. 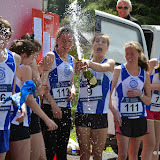 Victoria Wilkinson the 2014 English and joint British champion of Bingley Harriers made it four wins and a hat trick of titles in a row by retaining the Ladies Norman Berry Yorkshire Championship trophy. The Yorkshire Junior champs weren't introduced until 1996, but a glance at the Junior FRA English championship honours list is testament to how Vic progressed through the age categories, 1992 FU14 champion, 1993, 1994 FU16 champion, 1995, 1996 FU18 champion and in the Junior Home International her second, first, second and first, shows how she dominated between 1993 to 1996, with then a World Mountain Running championship in 1997. Vic's love for the sport has never waned and is still the same has when her dad, Chris took her along to the local show races as a ten year old. 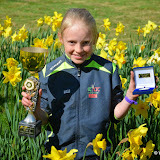 'I was pleased to retain the Yorkshire Fell Championship. 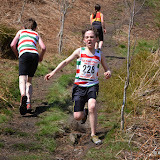 Being the last race of last season and the first of this one made it clash with the Inter Counties Cross Country Championships where a few athletes were. My first race after the winter it was a bit of a shock to the system to be racing again, but good all the same. Bring on the rest of the season!!' said Vic. 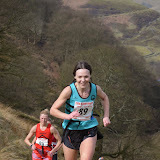 Sharon Taylor of Helm Hill Runners had a blinder of a run to win a silver, 25 seconds behind Vic and her medal collection is now three team gold, an individual gold from 2004, one bronze, and now four silver medals. 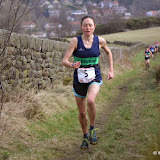 Claire Green broke an 18 year lapse when she took the bronze medal for the Pudsey & Bramley club, it was back in 1997 when Jane Clarke took the last medal a bronze, in fact the club have only won two more medals with Sarah Rowell gold and Jean Shotter silver in 1996. 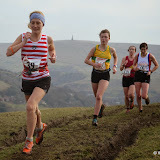 Calder Valley Fell Runners won the team for the third time with Gayle Sugden, Jo Buckley and Lindsey Oldfield, Jo was also part of the victory in 2006 when she ran under her maiden name Smith. In the FU23 championship, the Sarah Rowell salver trophy was won by Joanna Rycroft of Leeds City with 2012 FU16 champion and 2014 FU18 silver medallist Lucy Williamson collecting the silver while Lucy's sister Joanne won the bronze. Many thanks to Martyn Speight of The Wharfedale Clinic and Mike Ayers of Precision Pest Management for sponsoring the senior Yorkshire Fell championships.